Zyprexa, known generically as olanzapine, is a prescription medication used for the treatment of certain emotional, nervous, and mental conditions such as bipolar mania and schizophrenia. It can help reduce feeling of nervousness, increase concentration, and reduce incidence of hallucinations. It works by altering brain chemicals including serotonin and dopamine. Though it cannot cure diseases associated with an imbalance in the brain chemicals, it may provide temporary relief of the symptoms. Long-term use on a regular basis may also prevent some symptoms from returning. 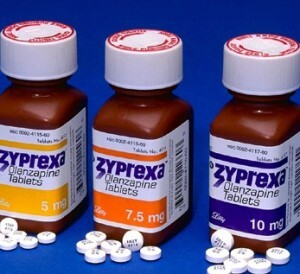 Zyprexa belongs to a group of medications called atypical antipsychotics. Other drugs that belong to this class include aripiprazole (Abilify), clozapine (Clozaril), risperidone (Risperdal) and ziprasidone (Geodon). The FDA approved olanzapine in 1996. Originally, olanzapine formulations were manufactured and distributed by Eli Lilly and Company, but in 2011 the drug became available in its generic form. Zyprexa is available in several forms. Oral Zyprexa tablets are available in olanzapine doses of 2.5 mg, 5 mg, 7.5 mg, 10 mg, 15 mg and 20 mg. Zyprexa Zydis orally disintegrating tablets come in olanzapine doses of 5 mg, 10 mg, 15 mg and 20 mg. The Zyprexa IntraMuscular injection (Zyprexa Relprevv) comes in a dose of 10 mg olanzapine. It is also available in parenteral drug formulation such as immediate release or extended release solution for injection. Zyprexa (olanzapine) are primarily used for the treatment of bipolar disorder (manic-depressive illness) and schizophrenia. It may be used along with Prozac (known generically as fluoxetine) for bipolar depression and depression that has not responded to other treatment options. Though Zyprexa cannot cure schizophrenia or bipolar disorder, it is effective at reducing and managing the disruptive symptoms. Zyprexa is indicated for adults and children older than 13 years. Although it helps manage behavioral symptoms, Zyprexa is not recommended for treatment of behavioral problems due to Alzheimer’s disease or dementia in older adults. It is sometimes used to prevent nausea and vomiting due to chemotherapy or cancer treatment. It may also be prescribed by your healthcare provider for other medical conditions not discussed. Read your prescription label carefully before you start taking the drug and at every refill. If you do not understand the prescription or have questions, talk to your healthcare provider or pharmacist. Take the medication exactly as directed, usually once a day. It can be taken either with or without food. Your dosage depends on your medical condition and response to treatment. Do not adjust your dose or stop taking the medication unless specifically instructed to do so. Try to take this medication around the same time of the day for maximum benefit and avoid missing doses. It should not be used for treatment or management of psychotic symptoms caused by dementia. Use in older adults increases the risk of heart failure, pneumonia, or sudden death. It can cause weight gain or high cholesterol levels, especially in young adults and teenagers. Regular physician visit and blood tests are recommended. It may increase blood glucose (sugar) levels. Regularly check your blood sugar levels while taking Zyprexa. It may affect your thinking or reaction to stimulus. Caution should be taken if you are driving or engaging in activities that require alertness. Zyprexa can make you feel dizzy. Do not stand up too fast or get up slowly from a sitting ot lying position to avoid dizziness or prevent fall. Avoid consuming alcoholic beverages while on Zyprexa. Increase your fluid intake, especially during exercise and in hot weather. This medication increases the risk of dehydration. Abilify (Aripiprazole) is an antipsychotic medication that is used to treat schizophrenia, bipolar disorder, depression and irritability with autism by changing the way certain chemicals and hormones are created and transmitted in the brain. An atypical antipsychotic, Risperdal alters the chemical levels within the brain to treat certain psychiatric disorders. Risperdal is one common trade name of the generic drug Risperidone. Seroquel is brand name for the generic drug Quetiapine and is a second generation antipsychotic medication. In the 1940s, it was found that lithium salts, naturally occurring minerals derived from the soft alkali element Lithium, had mood altering properties. Geodon (ziprasidone) is an anti-psychotic medication which helps treat the symptoms in patients who are suffering from various mental disorders such as Bipolar Disorder or Schizophrenia.